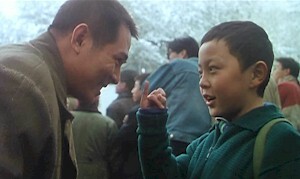 The Skinny: One of Jet Li's best collaborations with Corey Yuen. A predictably terrific action-adventure with uncommon sentiment courtesy of Anita Mui and Tze Miu. A first-rate action-adventure movie from Jet Li and Corey Yuen Kwai. Li plays a mainland cop who goes undercover in Hong Kong as a member of a gang of theives. Complicating things are Anita Mui as a tough HK cop who investigates Li, eventually leading to his family back in mainland China. Li finds himself embroiled in his bad guy identity until Mui returns to HK, bringing along Li’s son, the scene-stealing, kung-fu-kicking Tze Miu. Now Li must find a way to save his son without revealing his identity to the leader of his gang, played by a nasty Yu Rong-Guang (Iron Monkey).  Another member of the Miramax/Dimension coalition of evil, My Father is a Hero has been redubbed, rescored, and rereleased as Jet Li's The Enforcer. This is truly a title that aptly describes My Father is a Hero.  Please don't confuse this film with My Father the Hero featuring Gerard Depardieu.